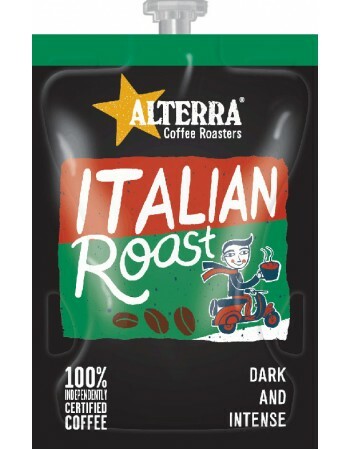 Indulge yourself with a perfect ALTERRA COFFEE ROASTERS, Flavia Italian Roast Coffee. An assertive, dark roasted coffee with a hint of caramel and spices. Italian Roast, very dark brown and shiny, burnt tones become more distinct, acidity almost gone, thin body. Fast Drinks vending are your first choice for secure Internet ordering and FAST delivery of ALTERRA Flavia Italian Roast Coffee refills. We are a leading Flavia supplier based in the UK. Our prices are some of the most competitive on the web and we are proud of our outstanding on-going customer service and support.